Posts tagged " technologies "
Exxon Mobil Corporation (XOM), one of the world’s largest publicly traded energy providers and chemical manufacturers, develops and applies next-generation technologies to help safely and responsibly meet the world’s growing needs for energy and high-quality chemical products. Exxon Mobil Corporation website. The table showed the market capitalization of Exxon Mobil Corporation experienced the downfall in 2008 at 15 percent and another 15 percent down the following year. 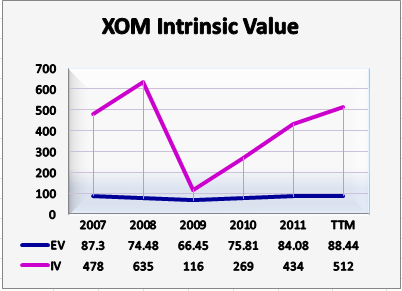 From 2010, XOM recovered with an increase of 11 percent average until ttm6. Total debt represented 3 percent of the enterprise value, while cash and cash equivalent represented 5 percent of the enterprise value, thus, enterprise value is lesser than the market capitalization by 2 percent. Buying the entire business of XOM would be buying 100 percent of the equity because cash and cash equivalent are greater than the total debt. The current buying price as of to date October 23, 2012, was $404.9 billion at $85.29 per share. The market price to date was $90.18 per share. The Net Current Asset Value (NCAV) is a method from Benjamin Graham it is to identify whether the stock is trading below the company’s net current asset value per share, specifically two-thirds or 66 percent of net current asset value. Meaning they are essentially trading below the company’s liquidation value and therefore, the stocks are trading in a bargain, and it is worth buying. The net current asset value method for XOM shows that the stock was trading at an overvalued price from 2007 to ttm6 of 2012 because the price was over the 66 percent of NCAV by 99 percent in average. This means that the stocks were trading above the liquidation value of XOM by 99 percent. The stocks did not pass the stock test of Benjamin Graham. Another stock test by Graham is by using market capitalization and dividing it to net current asset value (NCAV). If the result does not exceed the ratio of 1.2, then the stock passed the test for buying. So, let us see if the stock of Exxon Mobil Corporation passed the stock test. The market capitalization/net current asset value valuation (MC/NCAV) for Exxon Mobil Corporation tells us that the price was overvalued from 2007 to ttm6 2012 because the ratio exceeds 1.2. It shows that the stocks of the company did not pass the stock test of Benjamin Graham because the result of the valuation is greater than 1.2 ratio. The margin of safety is used to identify the difference between company value and price. Value investing is based on the assumption that two values are attached to all companies – the market price and the company’s business value or true value. Graham called it the intrinsic value. The difference between the two values is called the margin of safety. According to Graham, the investor should invest only if the market price is trading at a discount to its intrinsic value. Value investing is buying with a sufficient margin of safety. Graham considers buying when the market price is considerably lower than the intrinsic or real value, a minimum of 40 to 50 percent below. The enterprise value is used because, in my opinion, it is a much more accurate measure of the company’s true market value than market capitalization. Benjamin Graham’s margin of safety valuation for XOM shows that there was MOS from 2007 to ttm6 2012 at an average of 75 percent. The intrinsic value was erratic in movement and it was 413 percent of the enterprise value. EPS, the company’s last 12-month earnings per share; G: the company’s long-term (five years) sustainable growth estimate; 9 : the constant represents the appropriate P-E ratio for a no-growth company as proposed by Graham (Graham proposed an 8.5, but we changed it to 9); 2: the average yield of high-grade corporate bonds. The intrinsic value factors earning per share and the sustainable growth rate. By multiplying 9+2 to the sustainable growth rate (SGR) we get the annual growth rate. I have used the basic earnings per share in calculating the intrinsic value. The sustainable growth rate factors return on equity and the payout ratio. The return on equity was multiplied by the result of 1- payout ratio over 100. Then, we get the sustainable growth rate as seen in the formula mentioned above. The average ROE for Exxon Mobil Corporation was $28 and the average SGR was $22. Payout ratio was $25 average in five years period. XOM is paying cash dividends to its shareholders’ yearly. The table shows that the intrinsic value line was higher than the enterprise value line. In 2009, it shows a sudden drop of the line at -82 percent, then slightly going up at a rate of 131, 62 and 18 percent from 2010 to ttm6 2012 or an average of 70 percent. The distance between the two lines, enterprise value, and the intrinsic value is the margin of safety. There are two approaches in calculating the sustainable growth rate and this affects the intrinsic value and the margin of safety. 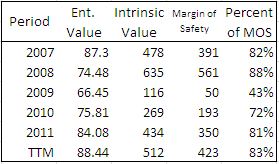 The table shows that relative return on equity produced a higher result than by using average approach, except for the margin of safety percentage. The P/E*EPS relative valuation for Exxon Mobil Corporation indicate that the price was trading at the undervalued price. Because the price (enterprise value) was lesser than the P/E*EPS results. The enterprise value per share was 97 percent, the price was 3 percent lower than the result of valuation, therefore, the price was undervalued. There is another approach in calculating P/E*EPS, and this is by using the average price to earnings ratio. The above table is the result of using the relative price to earnings ratio. It shows that using the average price to earnings produces a higher result, therefore, the price is undervalued by 5 percent. The use of this ratio is, to separate price and earnings in the enterprise value. The EV/EPS tells us that the price (P/E) 14 percent, while the earnings (EPS) was 86 percent. The price was only 17 percent of the earnings. The price indicates that stock was trading at an undervalued price. This metric is used in estimating business valuation. This metric is useful for analyzing and comparing profitability between companies and industries. The EV/EBITDA valuation was 5 years or 5 times. This means, that it will take 5 times the cash earnings to cover the costs of buying the entire business. In other words, an investor will wait 5 years to cover the cost of the purchase price. This method also shows the profitability of the company. The net earnings were 9 percent, while the gross margin was 37 percent. Moreover, XOM’s EBITDA was 19 percent on average. The market capitalization of Exxon experienced a down in 2008 and 2009 at 15 percent each year. Then an up movement in 2010 to ttm6 2012 with 11 percent average. The total debt represents 3 percent of the enterprise value. While cash and cash equivalent represent 5 percent of the enterprise value. Buying the entire business buying 100 percent of its equity because cash and cash equivalent are greater than total debt. The net current asset value approach price was overvalued because the stock is trading above the liquidation value. Likewise, In MC/NCAV price was overvalued because the price was over the 1.2 ratios. Moreover, the margin of safety for Exxon indicates an average of 75 percent. Using the average return on equity in calculating the sustainable growth rate, the margin of safety was higher by 1 percent at 76 percent. 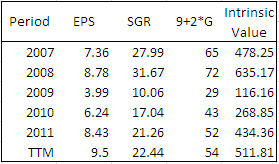 On the other hand, in PE*EPS valuation price was undervalued because the price was greater than the result of P/E*EPS. Using the average price to earnings ratio, the result was greater by 5 percent in the P/E*EPS percentage. The EV/EPS indicate that the price (P/E) was 14 percent average, while the earnings (EPS) was 86 percent. It indicates that the price was undervalued. Furthermore, it will take 5 years or 5 times the cash earnings to cover the costs of buying the entire business. XOM has a fair margin of earnings and was capable of generating sufficient revenue for its daily operations. The margin of safety was 75 percent and the relative valuation tells us that the stock was trading at the undervalued price. In other words, the price was cheap, I, therefore, recommend a BUY on the stock of Exxon Mobile Corporation.